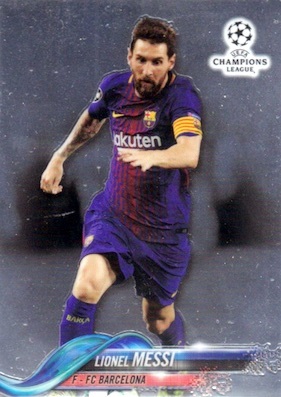 One of the biggest stages in sports finally gets the Chrome treatment with 2017-18 Topps Chrome UEFA Champions League. 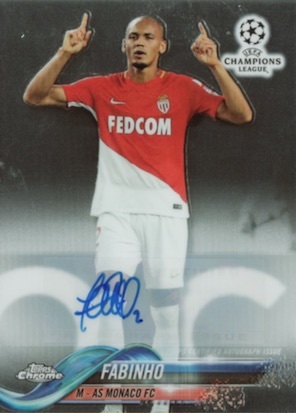 Offering some of the best club teams and players across Europe, each hobby box promises one signed card. 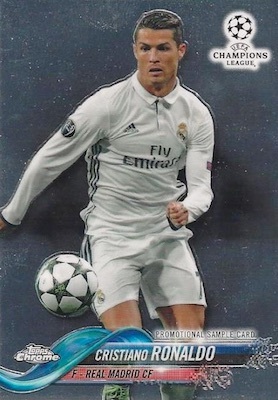 Although UCL collectors have enjoyed previous sets from Topps, the '17-18 product is the very first done with all chromium. It is also a Hobby exclusive. Coming ahead of the main release, Promo cards were issued in four-card cellophane packs at hobby shops. They are stamped "Promotional Sample Card" on the front. 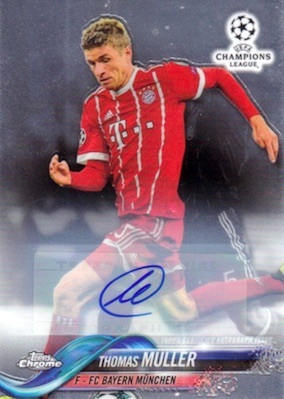 Using the flagship baseball design, the base set for 2017-18 Topps Chrome UEFA Champions League provides top players. Of course, it wouldn't be Chrome without all the Refractor parallels, including Base Refractors at 1:3 packs. As far as the numbered Refractors, we have Purple, Blue, Green, Gold (#/50), Orange (#/25), Red (#/10) and SuperFractor (1/1) options. 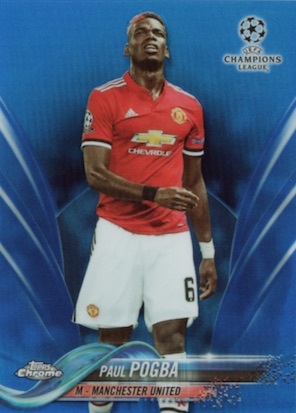 The 2017-18 Topps Chrome UEFA Champions League checklist also adds the Lightning Strike insert for the standout players, and Future Stars cards for those with considerable potential. With one per box, the autograph cards apply a signature to the base and insert designs. The main Autograph set is enhanced with numbered Green Refractor, Gold Refractor, Red Refractor (#/10) and SuperFractor (1/1) parallels. 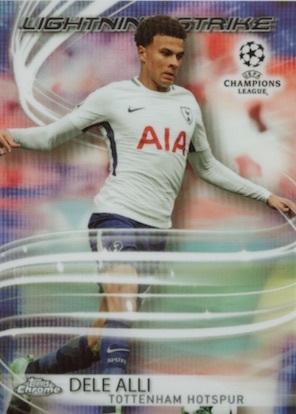 2018-19 Topps Chrome Finest Champions League Victor Wanyama Auto! 2018-19 Topps Chrome Finest Champions League Joao Cancelo Auto! REFRACTOR PARALLELS: Base Refractor (1:3 packs), Purple #/250, Blue #/150, Green #/99, Gold #/50, Orange #/25, Red #/10, SuperFractor 1/1. 5 cards. 1:246 packs. Full guide and gallery. 41 cards. 1:41 packs. Shop on eBay. REFRACTOR PARALLELS: Blue #/150, Green #/99, Gold #/50, Red #/10, SuperFractor 1/1. PARALLEL CARDS: Gold #/50, Red #/10, SuperFractor 1/1. 4 cards. Serial numbered #/25 or less. 1:2,044 packs. 2 cards. Serial numbered. 1:719 packs. 9 cards. Serial numbered #/50 or less. 1:719 packs. 8 cards. Found only in promo packs. Shop on eBay. 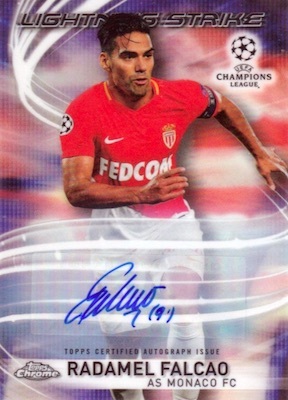 View the 2017-18 Topps Chrome UEFA Champions League checklist spreadsheet. Good: Refractors really pop; autograph checklist has many of the biggest UCL names; format keeps box prices more reasonable. Bad: Not much depth to the checklist; sticker autographs; not a very extensive selection of designs or creativity. 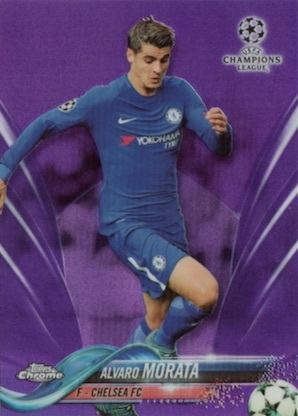 The Bottom Line: Floating under the radar, 2017-18 Topps Chrome UEFA Champions League is a pretty strong offering for UCL fans. With just 72 cards per box, it can feel a little underwhelming, but the chromium looks fantastic and the potential for a big autograph is there. The Flagship MLB design finds a new home with the Chrome Champions League base set. While it gets old seeing the same design in yet another product, the Chrome aspect is nice and it is the first chromium flagship version of the year. I admit I'm a sucker for Chrome but the Refractor cards do look awesome and there was just enough color in the review box to make me feel content. 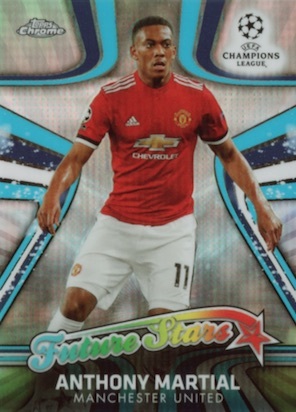 Although there are just three inserts, the Award Winners line is short printed so you are only likely to see Future Stars and Lighting Strike cards in a given box. I actually prefer the Awards design the most, but the other two are fine. The Future Stars look is essentially repurposed from 2017 Chrome Baseball and Lighting Strike curiously has no lighting. 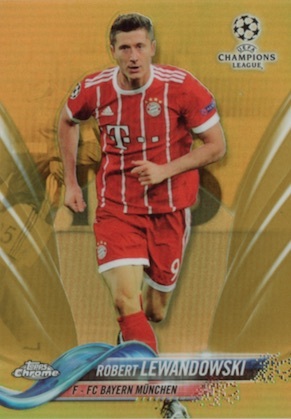 Taking the base or insert design and adding a sticker signature, this is, unfortunately, the norm for most soccer sets. I long for the on-card Chrome cards common in baseball sets. As far as the checklist, it really boils down to what you are wanting. If you are looking for good overall representation from the competition, the base set has multiple options for 20 teams, including 11 of the final 16 teams. The autograph lineup is much less diverse, though. 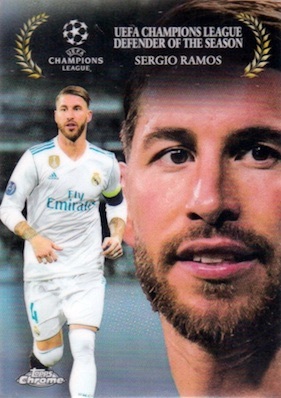 On the other hand, the list of signers features top talent like Cristiano Ronaldo, Lionel Messi, Neymar, Dele Alli, Harry Kane, Luis Suarez, Antoine Griezmann, Andres Iniesta, Thomas Muller, and Philippe Coutinho, among others. For those chasing the big hits, that is a pretty stacked group. Obviously, the set is rounded out with some weaker names, but it's hard to complain about the quality at the top. Running about $60-70 per box (at the time of this review) for one autograph and a few parallels and inserts, the value is okay but still risky. I do like that the format allows collectors a more affordable approach. To be honest, it feels like there should be double the content in each box, but the price would be over $100. It was a quick break even with 18 packs but it was enjoyable. Although the box didn't yield a high-dollar autograph, the Refractors supplied some top players in various parallel colors. Overall, I liked it and it left me wanting more. 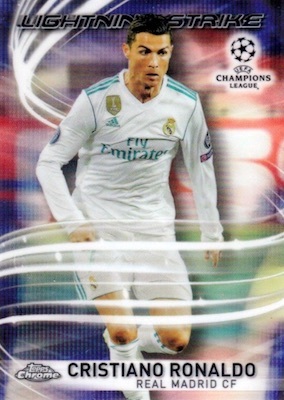 IN STOCK 2018-19 Topps Finest UEFA Champions League Soccer Hobby Box 2 AUTOS!